The 2014 IGDA Developer Satisfaction Survey listed Valve Software as the number one company developers would like to work for, above their own company. If you ask the gaming community what companies they'd love to work at, Valve Software earns a high ranking on the list. Well it turns out game developers share the same sentiment, preferring to work with Valve over creating their own company. The International Game Developers Association (IGDA) conducted a survey on 2,200 developers and found Valve took the number one slot for the question "What developer/publisher would you most like to work for?" Valve is popular for its hit games such as the Half Life, Left 4 Dead, and Portal series, and for the Steam platform itself. 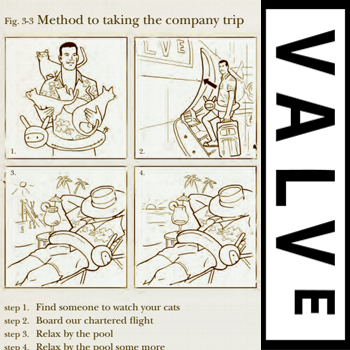 Valve earned more favor when their employee handbook was posted online and it detailed how employees have the ability to work on their preferred projects, have mobile desks, and it doesn't want its employees overworking themselves. Even in the timeline diagram of their history as a company the last bracket states "What's next? You tell us..."
According to a more detailed analysis of the survey, Valve had 12.07% of the votes while "my own company" came in a very close second with 11.79%. It's a stark difference from Activision's and Blizzard's third place ranking of about 5 percent.